Most organization have strategies in place. In my experience, organizations are generally pretty good at strategizing. But most strategies fail to deliver – 70% according to multiple research studies. Successful strategy execution requires a high performing organization. And the creation of high performing organizations is not trivial. This is one reason why high performing organizations have a strategic advantage – they worked hard to get where they are. Although the solution is not easy, there is a solution. Managers, and especially middle-managers are in a really tough spot. They need to deliver more and more, but organizational systems get in the way more often than they help. So while managers are running faster and more furiously than ever, they often cannot get to their most important work. This matters. Organizations in general fail to execute their strategies 70% of the time. In spite of a clear vision and strategy, as work flows down and across the organization efforts become diffused and confused. Most managers and employees are working hard, but they fail to give sufficient attention to the right work. What are some of the symptoms? Meetings. There are too many meetings and they tend to revisit the same issues instead of the accountable executive deciding. Work Flow Matters – a Lot! how work flows across the organization – the execution by each manager to ensure the appropriate support to their colleagues in other parts of the organization. You’re reading the article and recognize there’s room for improvement, now what? It’s time to talk to Dwight for a Free Consultation. Book your session today to begin your journey to a higher performing organization. The flow of work – both down and across the organization – depends on a framework for doing this work. This framework can be thought of as the “rules of the road” for how we work together in an organization. The absence of this framework leads to startling disconnects in organizations. In an article published in the March 2015 issue of Harvard Business Review, Sull, Homkes & Sull discuss their research on strategy execution. One of their findings explains why work that is delegated down the organization is not sufficiently focused. In spite of ongoing communications for the CEO about strategic initiative, in their poll fewer than one-third of the CEOs management team could name even two of the five top strategic priorities. Only 55% of the middle managers were able to name even one of their company’s top five priorities. With respect to work flowing across the organization, the same authors found that only 9% of managers say they can rely on colleagues in other functions and units all the time, and just half say they can rely on them most of the time. Moreover, efforts to resolve the resulting conflicts are handled badly two times out of three—resolved after a significant delay (38% of the time), resolved quickly but poorly (14%), or simply left to fester (12%). Our own research, in partnership with the Telfer School of Business, has developed a deeper understanding of the effectiveness of managers. 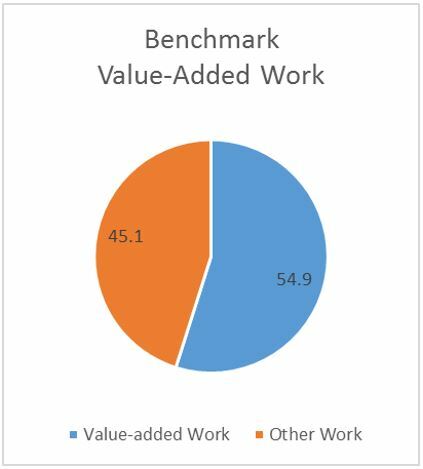 Our research shows that managers in a cross section of various sized organizations report spending only 55% of their time on value-added work. Almost half of their time is consumed doing work that is not adding value in the way it should and could. We also found that while 98% of managers agree that they are held to account for their work, only 46% believed that they are delegated clear objectives with statements of quantity, quality and timeliness. Managers know they are accountable for doing good work. But they are not clear about their priority activity. This results in the diffusion of effort. Managers simply are not able to focus in on their most important work. And one aspect of their important work is managerial leadership. In fact 60% of managers indicated that they are able to strike the right balance between doing their managerial work and the work that only they can do at their level in the organization. This creates a vicious circle where managers – throughout the organization – are not clear about their priorities, but their own managers are not spending the time they must spend on managerial leadership activities to set context for work, to clarify priorities, and to resolve conflicts in cross functional work. These are frustrations shared by organizations ranging from small enterprises to multinational corporations all over the world. The design of your organization and the effectiveness of your managers are directly tied to increased productivity and profitability. The most important relationship that employees have at work is with their immediate manager. The importance of these roles cannot be understated, but too often, management practices are not supported or structured in a way that allows for optimal results. So What Can You Do to Improve Strategy Execution? Like the “rules of the road” that keeps traffic moving, CEO’s need to ensure that there are “rules of the road” for doing work. An accountability and authority framework, such as The Effective Point of Accountability®, must be established to create the How We Work Together brand. We know managers want to do well. We also know they often do not set aside the time they need to do their managerial leadership work. So it is incumbent on every manager, from the CEO to the Front Line, to ensure that doing managerial leadership work is understood to be important and that sufficient time must be spent on ensuring that each and every subordinate manager is clear about their accountabilities and authorities. This creates a series of linkages from every manager back through the CEO to the organization’s strategy. 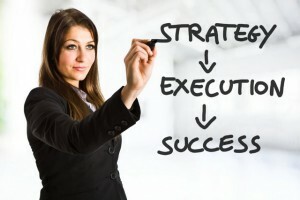 Find out more about how you can improve effectiveness in your organization at www.effectivemanagers.com. To learn more, watch the free recorded webinar on our YouTube channel. We address accounatbility PLUS the key steps you can take improve accountability in your team and in your organization. WATCH NOW: What Is the One Word that Can Turn Your Organization Around? Don’t forget to SUBSCRIBE to receive notifications when new content is published. Yes, accountability matters. Intuitively we know that when people are held to account performance is better. But what is accountability? How does an organization “become” accountable? Bottom line – how can you use accountability to improve the performance of your team and your organization? We cover these questions and more in this Webinar using The Effective Point of Accountability®, developed using research-based and field-tested approaches. 1. What accountability is (and is not) and why it is important in organizations. 2. How you can assess the current state of accountability of managers in your organization. 3. The key elements of an accountability and authority framework and how you can put them to use immediately. This recording will be of interest to all managers of managers in organizations, and will be of special interest to CEOs and Heads of HR.